Six years ago today, I sat among all of my earthly belongings in boxes and handed out candy to the kids in my new neighborhood. I had moved into StuccoHouse that afternoon. On that day, I thought the stains on the hardwood floors were water from open windows, that my sewer was in fine condition, there was absolutely no rot on my house, and that it would take me 2 years to fully restore the house. Tonight I will sit near my unassembled (yet, cleaner) stove on my patched hardwood floor and hand out candy to those same kids. In between trick-or-treaters, I'll chew on TootsieRolls and contemplate whether I'll be done with this house by my 10 year anniversary. I've been out of commission with a cold, but I did manage to motivate myself enough to get some WoodEpox on my windows. This wood epoxy went over the areas that I treated with LiquidWood last weekend. I had to take care to work the epoxy deep into the holes that I drilled. It's already pretty cured. It looks crappy now, and you are worried. Trust me, once sanded and primed you won't even know it's there. The last photo is just there to show off the amazingly tight & straight grain of this old growth, hard-as-a-rock pine. Moving on to less controversial topics. Here is a photo of what I am facing in my side yard (sorry, it's a bit fuzzy). For those not hip to this weed, it's Creeping Charlie. It is currently taking over my neighbor's side yard and working it's way towards my herb garden. I have spent many a summer's day pulling this stuff up by the root. It only seems to grow back with a vengeance. I've been told that the most effective time to deal with CC is right after the first hard frost. So, I'm toying with using chemicals. However, I also have trio of lilac trees over on that side of the yard and I'm nervous to do anything that may harm their roots. Because you know it would be just my luck that the chemicals would kill the lilacs and the CC would continue unfazed. Or do you think it would be totally tacky to run some landscaping edging for a short ways down the side between our two lawns to try to prevent the creeping? Spent a little time putting wood consolidator into some soft spots in the wood of the windows I have been stripping of paint. I drill holes around the soft spots so the Liquidwood can fully sink into the wood. When the consolidator is tacky, I'll fill the holes with WoodEpox. Honestly. The strangest things happen to me. I was sound asleep in bed when I heard my doorbell ring. It woke me up. I looked at my clock and it read 4:30 am. This was strange because my front doorbell has been out of commission for a while. But, it was definitely a doorbell. Definitely. I went out this afternoon and looked at my front doorbell. Nope, still not working. Then it dawned on me. I walked to my side door and looked at the doorbell. My side doorbell button has a chunk missing. There is something crawling up the stucco on the exterior of my house in the wee hours of the morning and chewing off the button of the doorbell. Sample Ballot You input your address and it will create a sample ballot that includes all federal, state, county, school district and judicial choices. Look up the Candidates Gives you links to the candidiate's info/websites for all races. UPDATE: I finally found a couple of user friendly sites to do candidate research. 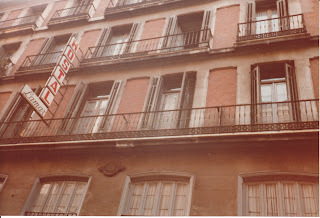 In the early 1980's I lived in downtown Madrid while I went to school. The building that I lived in was in the old part of the city. At the time the neighborhood was iffy, but filled with history. My laundry mat was next to the 17th century home of Lope de Vega. The owner of our building gleefully made a point to tell us that the building we lived in was older than the United States and rumor had it that it was once owned by the family of Christopher Columbus. He loved the irony. My room had a big old window that almost covered an entire wall. The "french" doors on this opening ran from floor to ceiling and opened on to a small balcony that overlooked a semi-busy street three floors below. This balcony was great fun in warm weather. We would stand out on the balcony, smoke our Spanish black tobacco cigarettes and watch the people below or flirt with the military guys that lived on the same floor in the building across the street. I once saw Steve Martin walk down the street below me. But, I digress. When the weather turned cold, this window was not so much fun. It loosely closed and "locked" with a lock that I also suspected was older than the U.S. Once the glass was shut, there were shutters on the inside that you could close. Then there was a heavy curtain that closed behind that. That was the entire extent of weatherproofing. The weather in Madrid is similar to that of Minneapolis. It's probably a little warmer there in the summer, their fall is shorter and lacks the change of leaves, and their winter has less snow. But, temperature wise, it's generally the same. In short, about mid-Oct it started to get very cold. When we started whining about being cold, the landlord, Don Fernando, told us that the city forbid him to turn on the heat until November 1. I really need to do a Google search on that, cuz I suspect it was a bunch of whoo-haa that he told us to pinch a penny. We were paying about $4 per night for full room and board, so we didn't have much leverage. At his mercy, we layered our clothes during the day and piled on the blankets at night....and reminded ourselves that which did not kill us, made us stronger. On October 31st, the other students & I planned a big Halloween/Turn on the Heat party. We dressed up in costumes, drank sangria and celebrated being warm. It was great fun. Something about those days stuck with me. For whatever reason, each year I try to last until November 1st before I turn on the heat. Last year I broke down early, this year I have been doing well. It hit 35 degrees f last night in Minneapolis, and my electric mattress pad kept me toasty. The house stayed at a balmy 54 degrees f.
In between thunderstorms this past weekend I scraped more paint. I seems like that's all I do lately. I'm pretty sure that if I died right now my gravestone would read "Here lies StuccoHouse. She scraped a lot of paint." I had planned on sanding down the epoxy repairs I made last weekend and getting that primed and painted. However, once up there on my ladder I discovered the epoxy hadn't set yet. The WoodEpox is kind of finicky. It's been very humid & cool here and that seems to have affected curing time. I've worked with this stuff before, so I know not to get too wigged out about it. I got up there with my heat gun and spent some time drying it out that way. I hope that next weekend, I'll be able to get it painted. 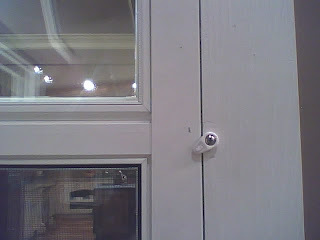 With the epoxy not quite done, I decided to use the heat gun on the double windows on that same side of the house. 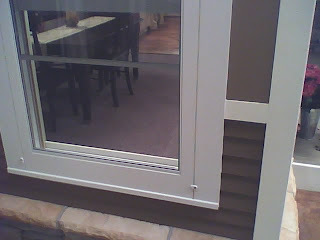 I posted last week about hunting down storm windows for them. I also hope to get the old paint off and a fresh coat of primer and the new yellow paint on them before winter sets in. When I'm up on my ladder I come up with what is arguably either 1) my best ideas; or 2) the ideas that catapult me into much bigger projects than I had anticipated. So, this time on the ladder, I decided that it would only be a bit more work to also remove the paint from the exterior side of the sash frames (I had originally planned on only doing the exterior window frame wood). I figure that once I have the new wood storms in place, it would be fairly easy to pull out the sashes and restore them without freezing to death (especially because only the exterior is painted - the interior is stained). 4 hours. I managed to get one side of the double window pretty well free of 80yrs of old paint. What remains should come off with liquid stripper. Yesterday afternoon, we took a few hours and drove south to an apple orchard to pick up some apples and check out the leaves. I think we were a few days early for the leaves, but the apples were right on target. Bonus points to anyone that recognizes the view. No, the Tappan vintage stove restoration has not been abandoned. It's still going on. In my living room. I ran into two screw that resisted attempts at removal. It has been a few weeks, but I have kept at them. Daily dousing them in oil. I moved from WD40 on to a more serious penetrating oil that stinks to high heaven and gives you true confidence that it is working it's way behind the rust. After some effort, I was able to remove one of the screws and finally pull out the broiler drawer rails (not sure if that's the technical term, but they are slides that sit on the bottom and hold the drawer in place and allow it to slide out) for cleaning and painting. That done, I can now fully clean out the actual broiler "cave." Progress may seem slow, but I think I'm actually nearing the beginning of the end of the cleaning part of this project. Maybe. One of the local news stations covered this a few days ago. I think it is just about the coolest thing I have heard about in a long time. I wish I had thought of it when I was redoing my front steps. It goes directly to my English major heart. St. Paul has an artist in residence named Marcus Young and his office is in a same building as the Department of Public Works. Serendipity. As creative minds will do, he started thinking about sidewalks in a new way. What would happen if you stamped poetry into a sidewalk? So, the city held a contest. 2000 people entered their poems. 34 were selected. The city is now busy stamping those poems into newly poured sidewalks for the public to read as they go along their merry way. I love, love, love this idea. Walt Whitman's "When I Heard the Learn'd Astronomer," Ezra Pound's "In The Station of the Metro" or maybe some e.e. cummings is SO going down on my backyard sidewalk when I replace it. Hmm....or maybe they would loan me one of their stamps. Some of the winning poems are excellent. I had big plans this weekend, but woke up Saturday with a whopping headache. I did manage to haul myself outside and up a ladder long enough to treat the corners of the fascia board I have been working on for the past few weeks with wood consolidator and wood epoxy. The wood just sucked in the consolidator, which is good. I want the wood saturated with the stuff. I probably used close to 3/4 a cup on the two ends. I've learned over the years working with this stuff that the WoodEpox works a lot better if you use the LiquidWood first and leave it wet. It's a little counter intuitive, but the thicker the layer of epoxy you put on, the faster it cures. I'm hoping the epoxy had enough time to cure overnight, because I woke up to a rain downpour this morning. I think it should be ok as the WoodEpox was already setting up yesterday as I was putting on the finishing touches. It doesn't look like much right now, but once sanded it should make a pretty solid and seamless repair. I'm hoping I will still have time to paint that board before we get any snow. I have been working on two windows on the side of my house this summer. I don't think I have posted about it. I took down the old aluminum storms windows and put in two of the vintage screens that I found a few summers ago at a garage sale. This was meant as a temporary fix while I worked on the windows and figured out what I was going to do for storm windows. I have about 3/4 of that hideous paint removed and winter is closing in. I need to make some decision about storms for those two windows (at least). While I love the vintage screen/storm window set-up, for security reasons (I live in the city), in windows that I want to open on first floor, I think I will probably go with some sort of combination storm. But, it must have a wood frame. So, yesterday I conned a friend into driving to Shaw Stewart Lumber to look at the wood framed combination storm windows that Marvin makes. I had my window measurements and was ready to order the storms if I liked them. After seeing them and getting prices, I'm undecided. 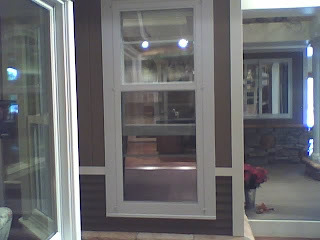 The windows come with a choice of 5 metal colors for the screen/glass insert frames (the actual storm frames are primed pine). None of those metal colors go with my gray storm paint color. The saleswoman told me I could paint that...but it would become one more thing to keep painted. There is an option to have a full screen attached to the frame, but that adds more to the cost. 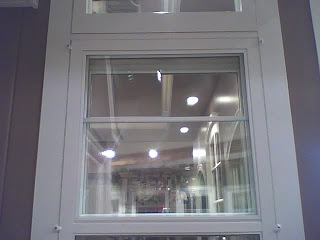 All of my windows are custom sizes, so these babies are pricey. That said, they are still the nicest combination wood storms I have seen. They take 2-3 weeks to order, so I still have a little time to decide. Here are some photos of the Marvin storms in the showroom (taken with my cell phone, so forgive the quality).